Update: It's official: Tender Defender is here, and he is glorious. Epic announced the skin's surprise release on Thanksgiving, a fitting release date for the avian avenger. As players suspected, Tender Defender also the spitting image of the revised art by Reddit user Etsyturtle2. Reddit user tfoust10, the father of the 8-year-old boy who drew the "Chicken Trooper" concept art that kickstarted this whole affair, says his son was delighted to see his idea realized in-game. "I surprised Connor with the skin right before we had to leave to an event, and he and his brother loved it," tfoust10 wrote in a comment. "Thanks to everyone on Reddit who made this possible. You made his day. He is sporting a permanent grin. You guys made me the coolest dad alive." Two months ago, Reddit user tfoust10 shared a Fortnite skin concept drawn by his 8-year-old son, Connor. Connor asked Epic to add the skin, dubbed the Chicken Trooper, into the game, and according to a new string of rumors, that's about to happen. As FortniteIntel reports, last week players began chatting about a datamined glider and pickaxe which resemble Etsyturtle2's sketch. Reddit user Shadow_Drgn also posted about some strange markings on one of Fortnite's assault rifles, which looks to have been engraved with a chicken foot and clawed by bird-like talons. More recently, some feathers appeared in the watchtower in Lonely Lodge, suggesting the Chicken Trooper has found a new roost. On the heels of all these hints, Etsyturtle2 returned to Reddit last week claiming that, yes, "the skin is coming." Etsyturtle2 also said Epic asked for permission to use their design, and that they'd been paid for their work. 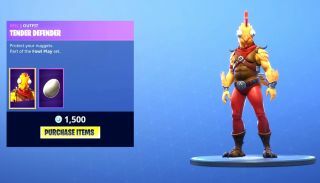 However, the skin will allegedly feature a new name: Tender Defender, as opposed to Chicken Trooper. I like both names, and I'm sure Connor would be delighted to see his creation appear in-game no matter its name. Tfoust10 said he's already looking for ways to surprise his son if the skin, which Epic hasn't officially announced, is indeed added. Tender Defender has joined the ranks of the best Fortnite skins.